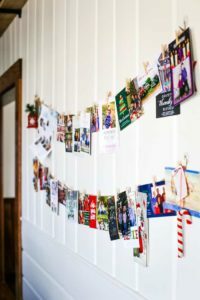 One of my goals with our farmhouse is that everything that gets hung on the wall will be meaningful. It’s a lot of pressure and it’s also why there still isn’t much on our walls. 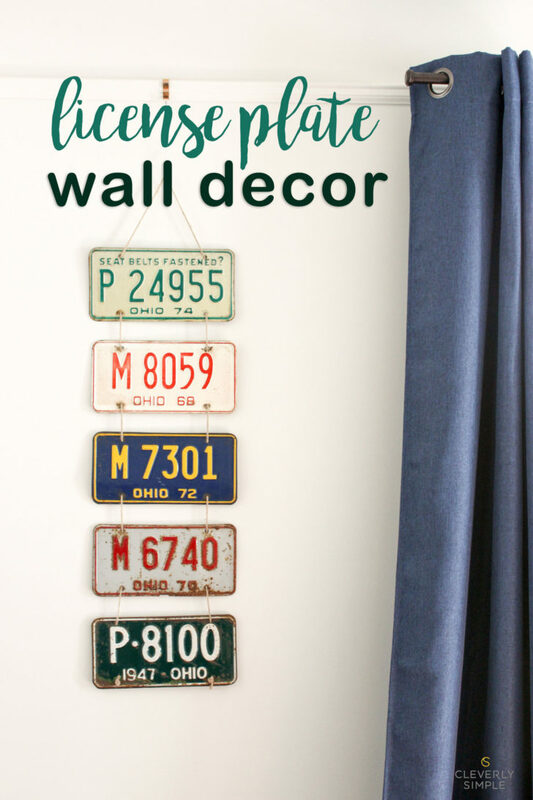 😄 However, my boys’ room is almost done with the license plate art wall decor I’m sharing with you today. It’s been easy to find little things to add to their space. 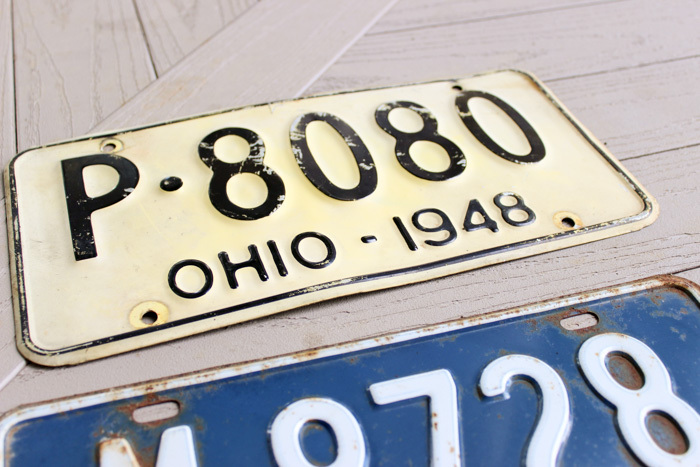 Our home was filled with farming memorabilia, antique cars, trucks – and every single license plate our family has ever owned. Sometimes all the stuff is overwhelming. Sometimes it’s just plain awesome. 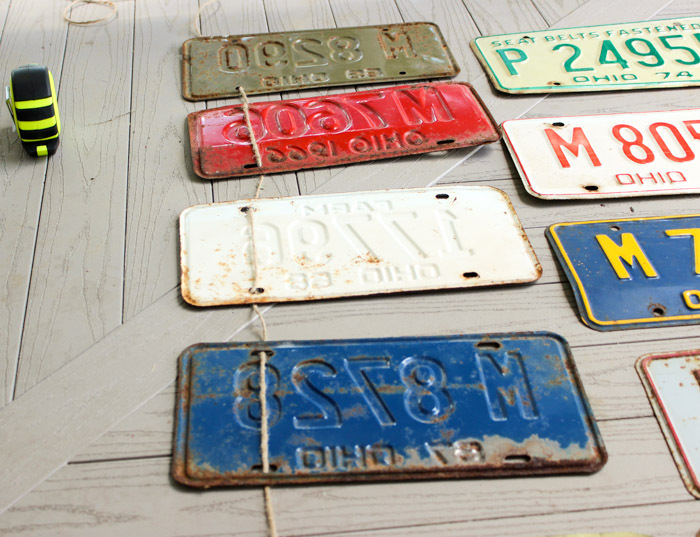 This time I was happy to have the stack of license plates to make something special for my boys. 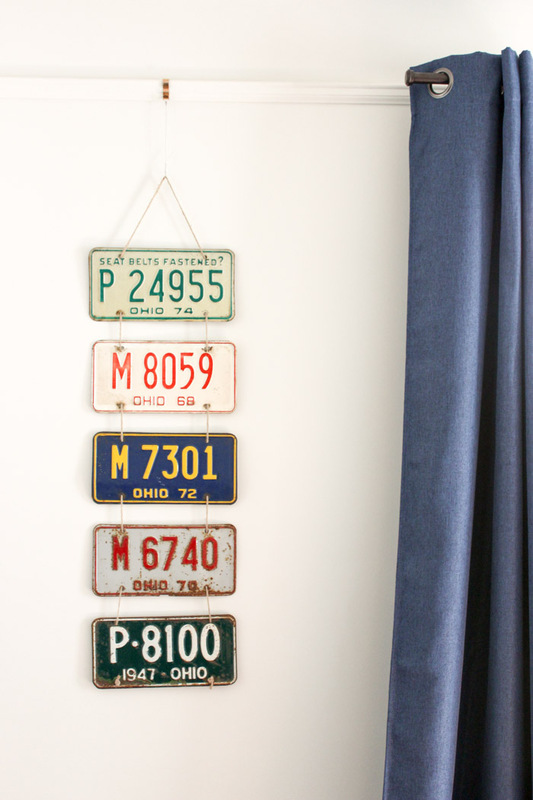 First of all, if your dad doesn’t drop off a stack of old license plates he found in the barn that date back to 1940 but you want to create some awesome license plate art for your walls at your home – count yourself as lucky. 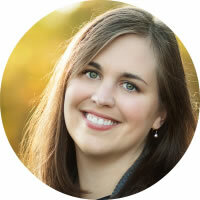 It probably means you don’t have everything else your family owned hiding in the nooks and crannies of the barn waiting for you to sort through it. 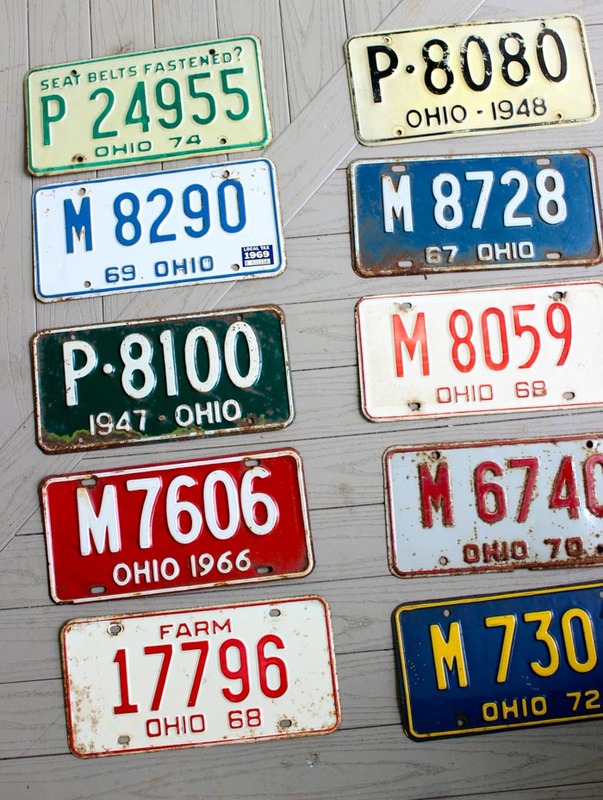 You can still make this awesome license plate art hanging by visiting antique stores. 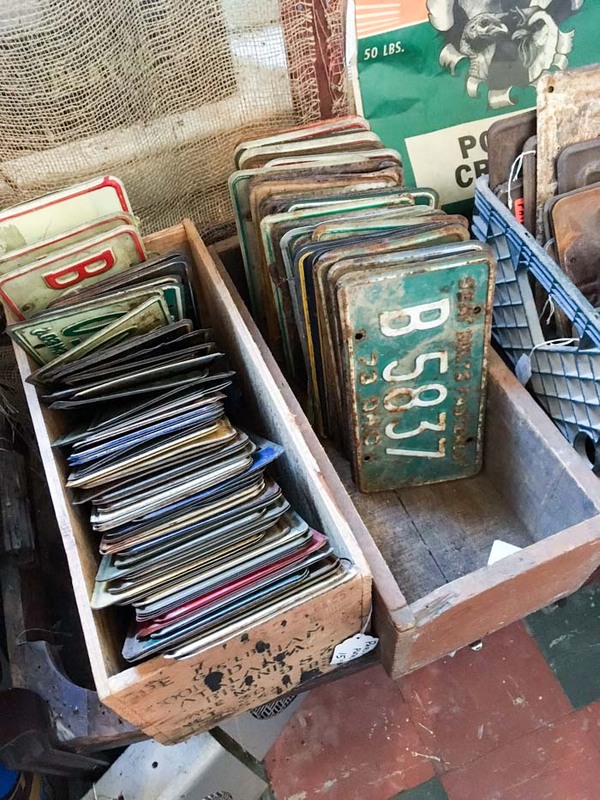 I found a great stack of antique license plates at a store in Mt. Victory Ohio. 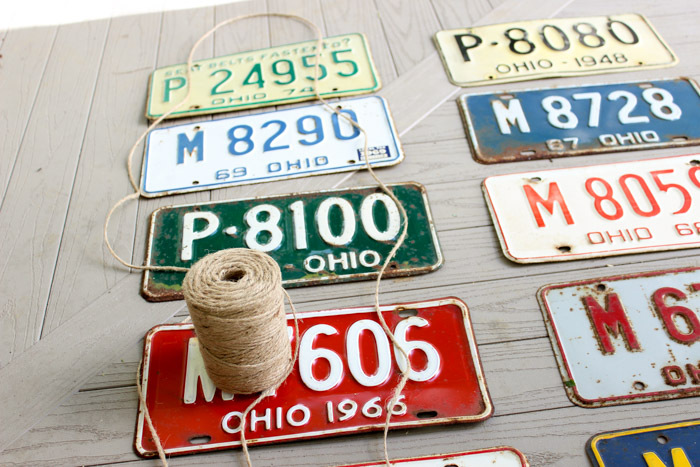 At first glance many of the older license plates will look too far gone for something you want to hang on your walls. However, a little scrubbing and dawn dish liquid will brighten them right up. I wish I had taken a picture of the “before”. Some of them were downright filthy. 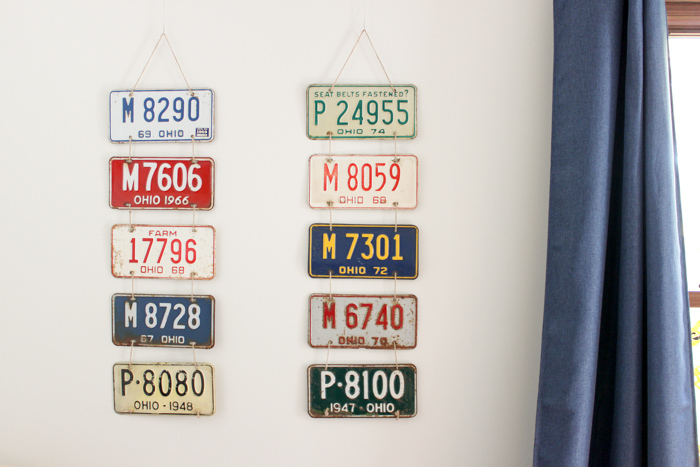 For my wall hanging, I wanted to use around ten license plates and make two separate hangings. Since these are sentimental in that my grandpa and his father owned the cars/trucks that they went onto – I wanted the boys to someday be able to take them with them. Because you know, they’re going to LOVE everything I make for them and they’re going to want ALL of it for their homes when they grow up. 🙂 At least I tell myself these things. Also, this is when my OCD can kick in. I wanted to hang them by date but then the colors would not balance each other. It was a catch-22 so I decided to go with the color variance as the priority since that was most noticeable. After arranging them so they would look nice, I measured out the rope I would use. 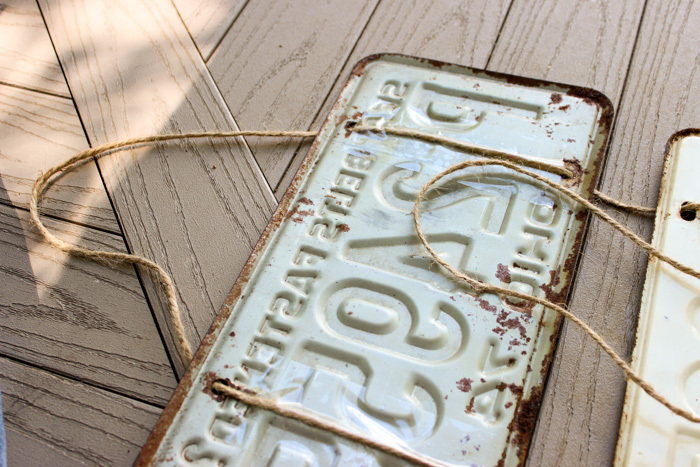 I wanted to use a thicker rope but unfortunately the 1940’s license plates have smaller holes and it wouldn’t fit. 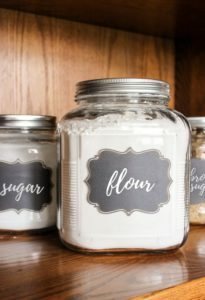 So if you don’t have the 1940’s you can probably use a thicker rope to make the look a little more rustic. I strung the string (is that correct?) 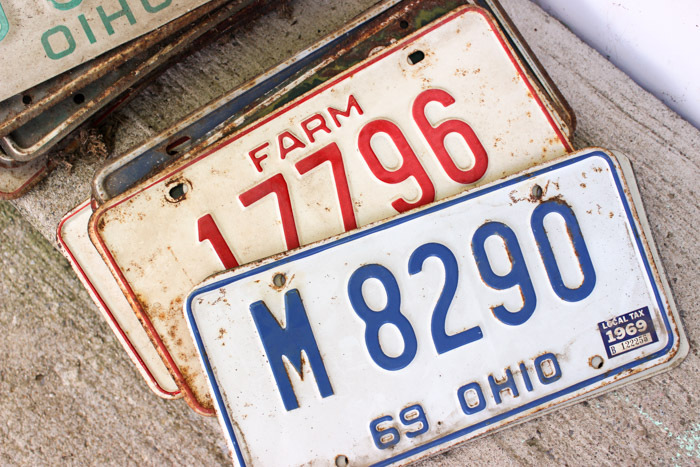 through each license plate. 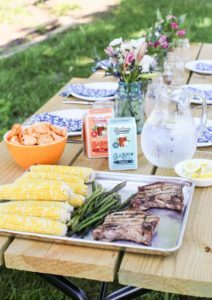 Make sure you have them lined up how you will want them. 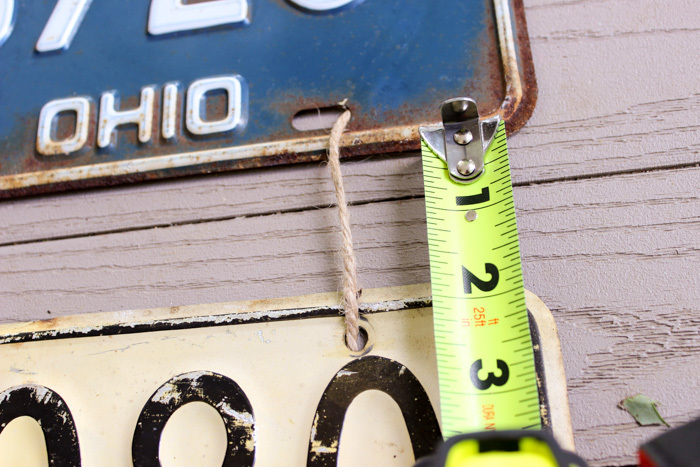 Making sure to measure between each one was key so that they would hang evenly. I chose to go with about 1.5 inches between each one. To keep the string from allowing the license plates to sink into each other once hung, I taped each string on the back of the license plate. I also allowed for a loop (that was measured) at the top to hang them. The entire hanging used one long piece of continuous rope. At the bottom of the entire piece I knotted the rope. And that’s all there was to it. 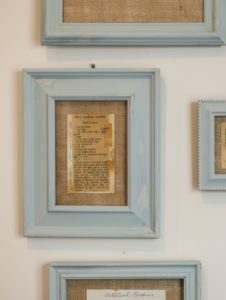 We have a picture rail in all of our rooms, so it was easy to loop the wire to hang these evenly. 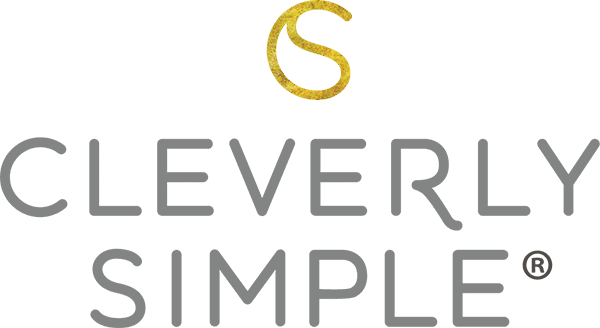 If you don’t you can use command hooks or a simple nail in the wall. All in all I love how the license plate art turned out! I was a little worried about the tape sticking in the back to keep them hanging evenly, but they’ve been hanging now for months and look the exact same. Winning! 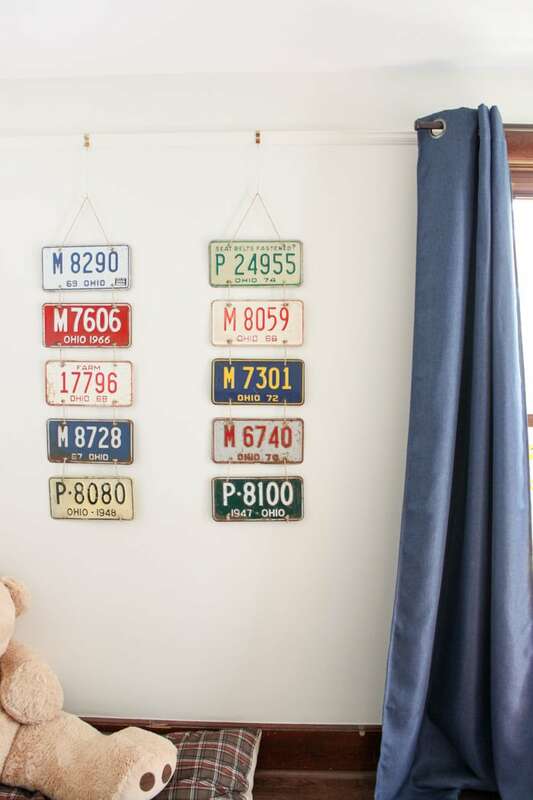 If you have a few license plates hanging around and want to bring some color to a room, this could not be an easier way to display them!